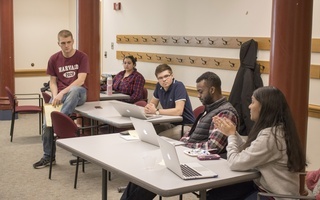 Henry S. Atkins '20 (center), Andréa G. Martinez '20 (background left), and Seth D. Billiau '21 respond to questions and debate on legislation they sponsored to revoke funding for Harvard College Faith and Action. The Undergraduate Council voted Monday to bar Harvard College Faith and Action from receiving UC funding after an at-times contentious debate that lasted nearly an hour. Any move to reinstate funding for the group will be subject to the approval of two of the Council’s internal bodies, the Finance Committee and the Queer Caucus. The UC added this stipulation to the legislation in an amendment Monday evening to ensure a diverse set of representatives will take part in the decision to reinstate funding. Last month, the College placed HCFA—the largest Christian fellowship on campus—on year-long “administrative probation.” The Crimson reported in February that the move to punish HCFA was almost certainly linked to the group’s decision to remove a female, bisexual student from a leadership position after she chose to date a woman. In total, 26 Council representatives voted in favor of the legislation to suspend funding, while eight voted against the proposal and two abstained. Scott Ely ’18 and Molly L. Richmond ’18, the co-presidents of HCFA, could not immediately be reached for comment Monday evening. At a UC Finance Committee on March 7, the committee recommended the Council ban HCFA from receiving UC funding. That recommendation followed a failed vote—held in February, days after College administrators announced HCFA’s probation—during which the finance committee nixed a previous draft of legislation also intended to bar the religious group from UC funding. During that vote, members operated under the assumption “administrative probation” meant HCFA was automatically prohibited from receiving Council funding. At the March 7 meeting, UC Vice President Nicholas D. Boucher ’19 said Alexander R. Miller, the College’s associate dean of student engagement, told him the College’s decision did not impact HCFA’s eligibility to apply for and receive UC funding. Administrators have repeatedly refused to publicly clarify the terms of HCFA’s probation—but The Crimson reported earlier this month that the punishment will likely have little practical effect. On Monday, Finance Committee chair Henry S. Atkins ’20 recommended the Council strip HCFA of its ability to receive UC funding. “We think that it’s appropriate that, as a result of apparent discrimination that seems to have occured within the organization, that we as a Council take a stand on this,” Atkins said. Since the 2015-2016 school year, HCFA has received more than $1,000 in Finance Committee grants, according to the committee’s records. Though it may have little effect given the amount of Council funding HCFA has historically accepted, Sarah Fellman ’18, a Quincy House representative, said she thinks the Council’s vote is nonetheless important. The Council in late February passed a resolution denouncing the actions of HCFA and affirming its support for BGLTQ Harvard affiliates. Multiple Council members said at the meeting they are concerned cutting UC funding would unnecessarily harm HCFA’s general membership, rather than just the group’s leadership. Victoria M. Marquez ’20, a Pforzheimer House representative who voted against the legislation, said suspending funding for HCFA would also affect organization members who did not play a role in the controversial decision to demote the bisexual student. “I know it’s a huge, over 200-student organization, so if we do choose to suspend the funding, it’s affecting a lot more people than the people involved in this decision,” Marquez said. Other representatives questioned the Council’s ability to verify the allegations against HCFA’s leadership. 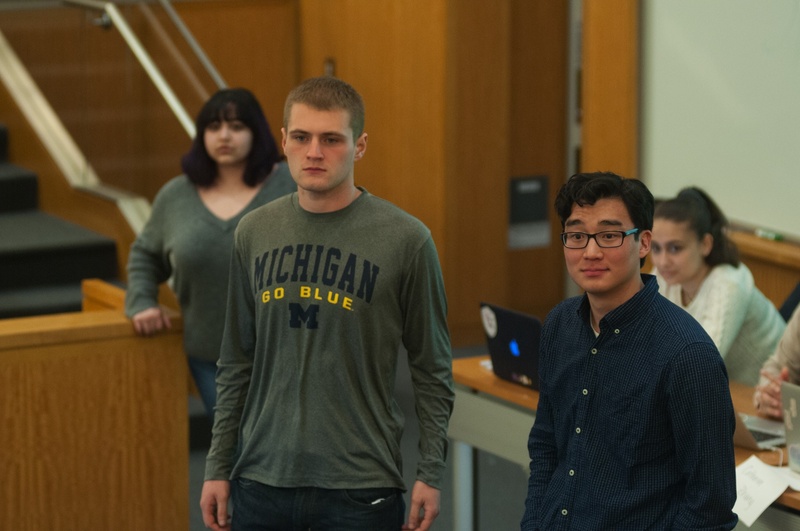 Parth C. Thakker ’18, a Kirkland House representative, characterized the Council’s discussions as focusing on the veracity of what occurred as opposed to the representatives’ opinions on the issue itself. 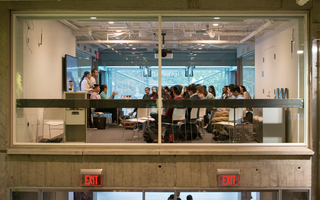 “A lot of the disagreement we had in this room was more on what exactly occurred, whether it was discrimination or a celibacy rule, rather than, per se, how we all feel about what occurred,” Thakker said. The Council previously debated inviting HCFA leadership to field questions from UC representatives before deciding whether or not to cut the group’s funding. Boucher, in a Slack message sent Sunday night and obtained by The Crimson, invited all Council members to an optional question-and-answer session with HCFA leadership before the Monday meeting. Six UC representatives attended the meeting to discuss the proposed funding ban, according to Boucher. Atkins conceded the Council could not independently verify the allegations against HCFA. But he argued there was sufficient evidence for the UC’s decision to ban funding. “I think that the evidence out there is compelling enough that it would be a miscalculation on our part not to take action,” Atkins said. —Staff writer Michael E. Xie contributed reporting to this story.